Only 3 months into working for Xero, and I’ve asked a variation of this question several times already. 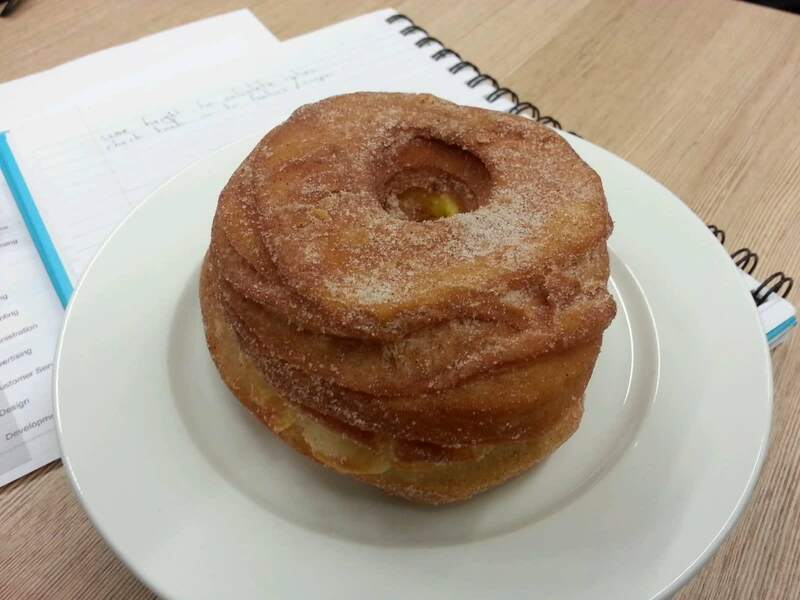 It’s not always donuts; today, it happens to be a ‘cronut’, which in name is close enough. 2) …I mentioned during my phone interview. 3) There’s a vending machine on the floor that gives out free sodas. Coke: free, L&P: free, anything with a modicum of fruit in it: $$. 4) One of the QA team that I’ve worked with a bunch since starting, always has some kind of bag of sweets from the US in his drawer. Every so often he’d bring out one of those bags and share them around. I joke about these things, and always in a good way. I also find that, whenever I’m asked about my new job and how things are going for me so far, I talk about the sugar-laden parts and my roles and responsibilities with equal enthusiasm: my role as a front-end developer, our free-soda vending machine, making the web browser “sing and dance”, all the for-the-fun-of-it amateur bakers I work with, being able to work with like-minded people, and the guy with a bottomless drawer of candy from America. One of my friends put it down to me still being in that ‘honeymoon period’ - where the novelty of doing something new just makes everything else seem so damn wonderful. Maybe there’s some truth to that, but I can’t imagine that the reason I leave the work building every weekday with an ear-to-ear grin on my face and a positive outlook on life is purely because of a sugar high.